Anlin Wang is struck on the back of his head by Office William Gress on July 3, 2018. An activist has filed a lawsuit against a Philadelphia police officer for allegedly using excessive force against him at a protest last week at the local office of U.S. Immigration and Customs Enforcement. Anlin Wang's suit said an officer identified as Brian Gress hit him when police were removing activists from the encampment outside an ICE building at Eighth and Cherry Streets on July 3. The protesters, who oppose President Trump's immigration policies, were trying to shut down the office. Wang, 25, was standing with other demonstrators when the officer "physically assaulted" him, "struck him in the head, forced him to the ground, and jumped on top of him," according to the suit. Part of the incident was captured on video by NowThis News. Wang, wearing a red-and-white T-shirt, can be seen on the ground with several officers standing over him in a chaotic scene. He stands and a person with a "Gress" badge appears to smack him in the back of the head. The initial version of the complaint, filed Monday, named another officer, William Gress, as the one who struck the protester. But Wang's lawyer, Paul Messing, amended the lawsuit Tuesday afternoon after city lawyers confirmed the officer on the scene was Brian Gress, a lieutenant in the department's Counter Terrorism Unit. John McNesby, president of Philadelphia's police union, said the two Gresses are brothers. Along with Brian Gress, the suit names the city and other, unidentified officers as defendants. Officer Troy Brown, a spokesperson for the Police Department, said he would "not be commenting due to pending litigation." Mayor Kenney's office declined to comment on the lawsuit for the same reason. The incident was also captured by photographer Bastiaan Slabbers. In some of his images, a person with a "Gress" badge is seen stomping on Wang's glasses, Slabbers said. Glasses belonging to protester Anlin Wang are crushed by the feet of an officer as police clear demonstrators from blocking the loading dock of a U.S. Immigration and Customs Enforcement office in Center City on July 3, 2018. 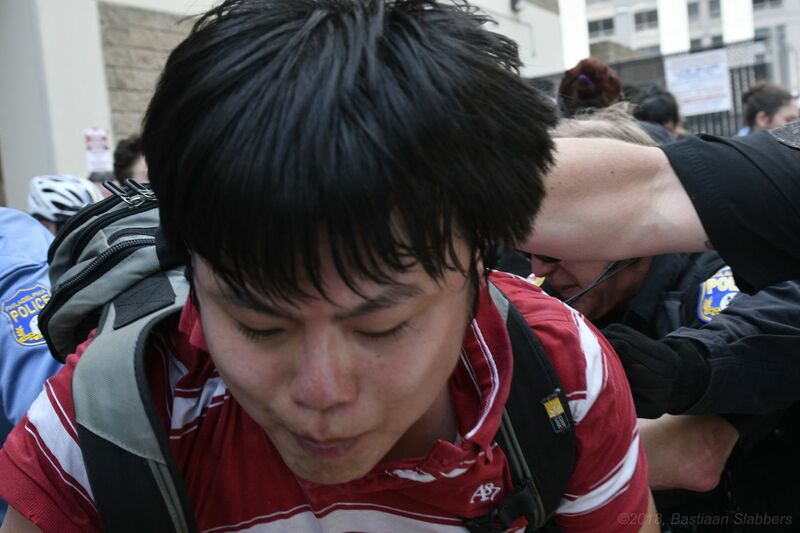 Anlin Wang appears to be struck on the back of the head as police clear protesters from blocking the loading dock of a U.S. Immigration and Customs Enforcement office in Center City on July 3, 2018. The lawsuit, which was filed in federal court in Philadelphia, states that "at no time did Mr. Wang pose a threat of harm to the defendant officers" and that "there was no legal cause to justify the defendant officers' use of force on Mr. Wang." The suit also criticizes "the improper deployment of paramilitary police units, including the Counter Terrorism Unit, to confront peaceful protesters." Wang, a city resident, previously worked as a field director for Democrat Molly Sheehan, an unsuccessful congressional candidate in the new Delaware County-based Fifth District. He attended a meeting on Monday night with immigrants' rights advocates and Kenney, where they discussed a contentious city database that shares arrest and court information with ICE. Two days after the incident involving Wang, police officers destroyed the encampment outside the ICE building. City Councilwoman Maria Quiñones-Sánchez called the police response "heavy-handed," and Democratic ward leader Nikil Saval said it almost constituted "a threat to civil liberties." Kenney's office defended the Police Department's clearing of the encampment last week, saying that even though Kenney agrees with the anti-ICE activists, he could not "allow individuals to create a threat to public safety by blocking access to a building and setting up permanent encampments." At the same time, Kenney said that he asked the Police Advisory Commission to examine the raid.